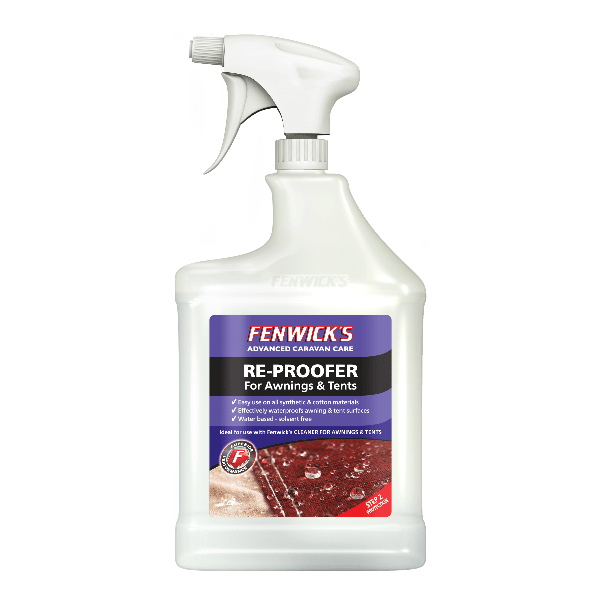 Fenwick’s Canvas Reproofer for Awnings & Tents is a water based fabric sealer and ideally suited to reproof your TreePod Lounger or Cabana. Ideal for use after cleaning your TreePod, tent or awning with Fenwick’s Cleaner for Awnings & Tents. Fenwick’s Reproofer for Awnings & Tents is a water based, solvent free, stain protective hydrophobic coating. Ideal for water proofing colour fast canvas & other synthetic fabrics. One litre will cover 15-30 square metres of fabric and canvas. Throughly clean surface with a recognised canvas cleaner. We suggest and recommend Fenwick’s Cleaner for Awnings & Tents, rinse thoroughly with clean water and allow to dry. It is recommended that this canvas reproofer is used in a well ventilated area. It is important that you do not inhale the vapour. Spray evenly over the whole surface. Allow to product to soak in and dry thoroughly. A second coat may be necessary. This can be applied before the first coating has completely dried. Packaging may differs from that shown currently. We recommend you follow the instructions on the bottle.